NASA has launched a mission to get closer than it's ever gotten before to the sun, its corona and solar wind. After a 24-hour delay, the mission, called Parker Solar Probe, launched early Sunday. Here is what you need to know about the Parker Solar Probe. What is Parker Solar Probe (PSP)? PSP is the only NASA mission, scientific probe to study the sun’s corona and solar wind. The mission is named for Dr. Eugene Parker, a physicist at the University of Chicago who proposed the existence of solar wind. It is the first NASA mission to be named for a living researcher. This mission is the brainchild of Parker, who long ago predicted the turbulence of solar energy and its impact on our planet. At a press conference last week, Parker said of his namesake mission: "I expect to find some surprises." How does the probe work? It will be the fastest human-made object with speeds up to 430,000 miles per hour, able to survive million degree temperatures, orbiting the sun just 4 million miles from its surface, after a 90 million-mile trip, to get the first measurements of the sun's energy. What are the challenges in this mission? The temperature near the sun's corona can be viewed as an obstacle, according to Geoffrey Brown, a public affair officer with the Applied Physics Laboratory at Johns Hopkins University. “The spacecraft must operate in the sun’s corona, where temperatures can reach millions of degrees," Brown told ABC News via email. "To protect itself, the spacecraft has a thermal protection system, or heat shield, that will provide a shadow in which the spacecraft will 'hide' to perform its scientific data gathering. The outer sun-facing side of the shield will reach 2,500 Fahrenheit at closest approach to the sun." (Jim Watson/AFP/Getty Images) Engineers examine the Parker Solar Probe during a media preview at NASA Goddard Space Flight Center in Greenbelt, Md., March 28, 2018. 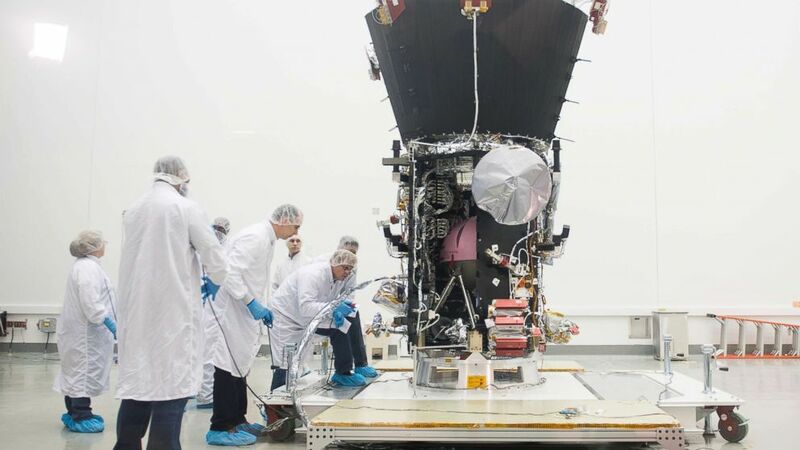 The spacecraft is undergoing final testing before it ships to NASAs Kennedy Space Flight Center in Florida for a scheduled July 31 launch when it will travel on a daring trek, traveling closer to the Sun than any spacecraft in history. What does Parker Solar Probe mean for humanity? “The mission will unlock mysteries of the corona, including why it’s so much hotter than the surface of the sun which is about 10,000 Farenheit,” Brown said. How close can you get to the sun without being burned? Parker Solar Probe will find out if its cutting edge heat shields will work -- this death-defying spacecraft will fly daringly close to the sun -- closer than any spacecraft before it. Just imagine how sizzling hot it is even without the advanced heat protection that will keep this tiny space probe from burning to a crisp. (NASA/ZUMA Press/Newscom) In the Astrotech processing facility in Titusville, Fla., near NASA's Kennedy Space Center, June 5, 2018, technicians and engineers perform light bar testing on NASA's Parker Solar Probe. This mission is exciting because never before have we had the opportunity to get this close to the sun. Solar weather isn’t something most of us are aware of -- not like approaching thunderstorms or blizzards or tornadoes -- but it impacts our technology, our satellites, the electric grid and our communications networks. Also, astrophysicist Hakeem Oluseyi says this is one of NASA’s most exciting missions. “We need to get an up-close view to see this solar processes, to improve our understanding of how the sun works," Oluseyi said. "This will help us understand how stars interact with [the] planets that orbit them and may give rise to new technologies." David Alexander, director of Rice University’s Space Program, says you cannot overestimate the importance of this mission. "It will help us understand a fundamental aspect of the sun-Earth interaction, the solar wind," Alexander said. 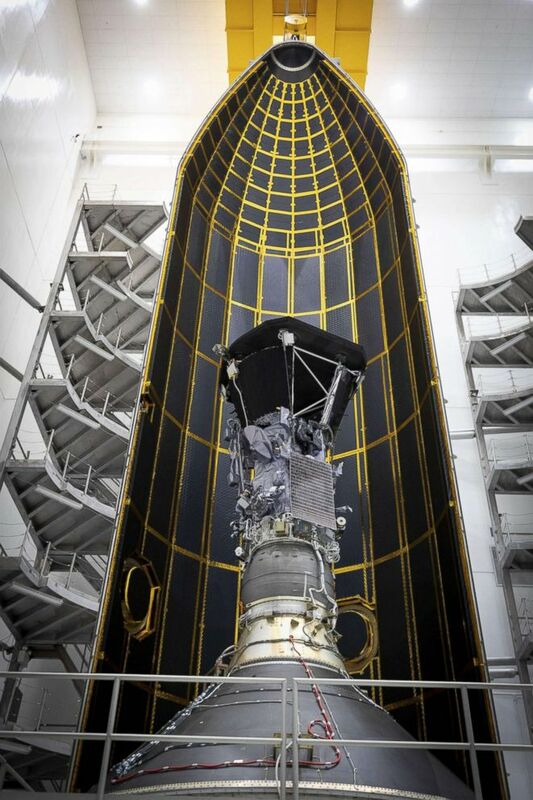 (AFP/Getty Images) This NASA photo obtained Aug. 1, 2018, shows the Parker Solar Probe one half of its 62.7-foot tall fairing, as the Parker Solar Probe was encapsulated on July 16, 2018, in preparation for the move from Astrotech Space Operations in Titusville, Fla., to Space Launch Complex 37 on Cape Canaveral Air Force Station, where it will be integrated onto its launch vehicle for its launch that is targeted for August 11, 2018. When will the Parker Solar Probe be launched? The launch was scheduled for Saturday, but technical glitches meant it didn't lift off until 3:31 a.m. ET Sunday from Space Launch Complex 37 at Cape Canaveral Air Force Station in Florida. It was launched on a Delta IV Heavy rocket. The Parker Solar Probe launch was delayed several times already, but needed to launch by Aug. 19 to line up flyby of Venus, which will act as a slingshot to get PSP into the right trajectory away from Earth toward the sun, for its seven-year mission, orbiting the sun seven times. How long will the whole mission last? “The mission is slated for a seven-year primary mission,” Brown said. 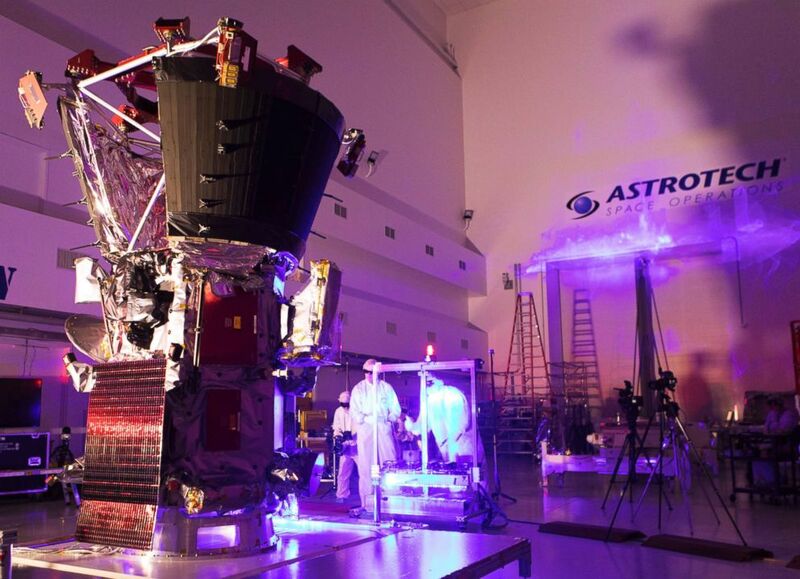 What is Johns Hopkins’ role in the Parker Solar Probe? “The Johns Hopkins Applied Physics Laboratory (APL) designed, built, and will manage the mission for NASA," Brown said. "APL will operate the spacecraft from a mission operations center on APL’s campus in Laurel, Maryland."